Several times in history people and companies have taken big risks and won equally big. It’s the fuel for ambitious innovation and business venture as well it should be. Conversely, there are plenty of huge failures for the simple reason that no one, no matter how smart or successful really can predict what will capture the market’s interest every time. Here are three perfect examples of all the right moves resulting in a great big belly flop. To start with I have to admit that I don’t remember this bold move by Honda, but someone on Facebook reminded me of this egg they laid back in the 1980s. In an effort to avoid showcasing ugly rust often encountered on disc brake rotors after exposure to rain, Honda built the 1982 and 1983 VF400F with inboard brakes. Mission accomplished in that regard since no one could see the rotors while covered with the aluminum housings. These inboard brakes also took root in the CBX550F with similar disappointment. The experiment was over and inboard brakes went out with a whimper by 1990. These brakes worked well enough. 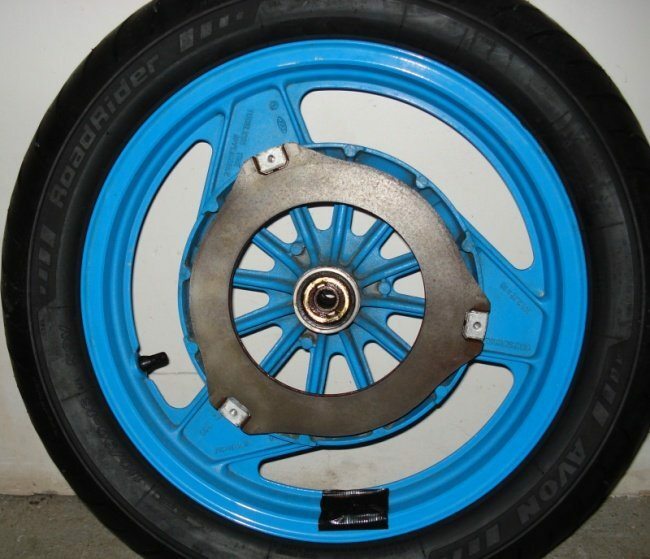 At least as well as any other disc brake system did, but cooling them was very difficult because they are enclosed. Once they got warm from aggressive braking it wouldn’t likely happen in time before the rotor would warp from heat exposure. In my day job as a Heavy Duty Mechanic, I see plenty of inboard brake systems on large construction equipment that provides better braking than an exposed disc system could. The difference is that heavy equipment braking system discs are bathed in cooling oil pumped through the housing instead of trying to use airflow. The oil keeps the brakes at a more constant temperature to stop warping from happening. If Honda could have engineered how to manage an oil bath for this braking system perhaps more bikes would have inboard brakes today. I think the oil bath system would have added too much weight to the bike though, even if they could have figured it out in reality. 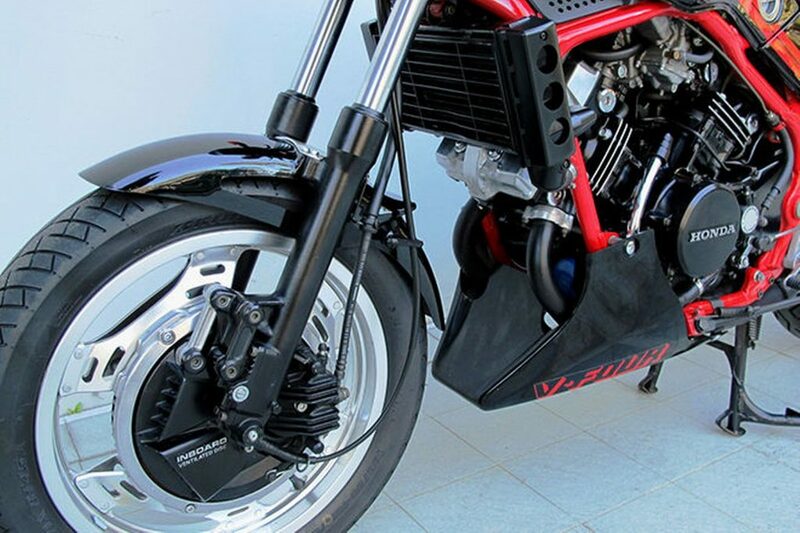 It was a great concept, but not practical on a motorcycle, because there’s just not enough metal surrounding the brakes to absorb the heat and allow it to disperse naturally. Honda is the victim again in the hall of shame with the automatic transmissions they stubbornly marketed back in the late 1970s into the early 1980s. 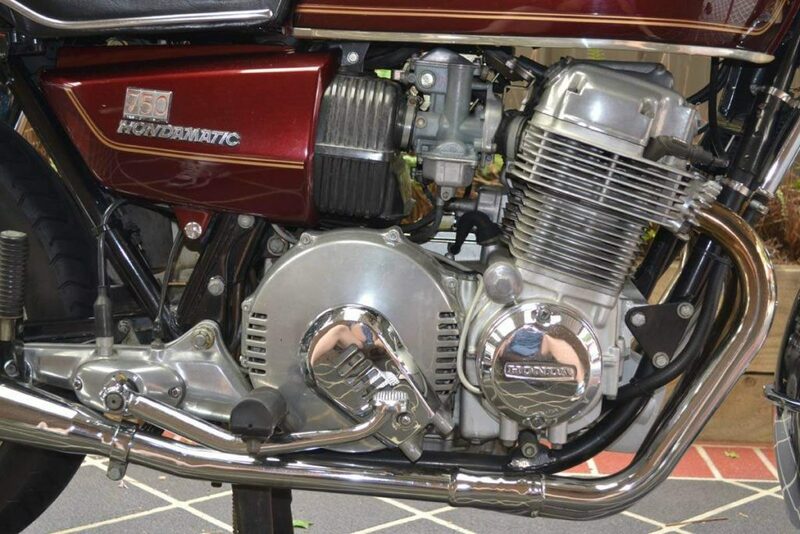 Originally, the Hondamatic transmission was found on the CB750A from 1976 to 1978. This “automatic” transmission wasn’t a true auto exactly the same as the one in most cars these days since the rider would have to shift from NEUTRAL to LOW and then HIGH once they got rolling down the road. Reports I’ve read about it say that in the city people had to leave the bike in LOW to have enough torque to move around with any degree of safety. 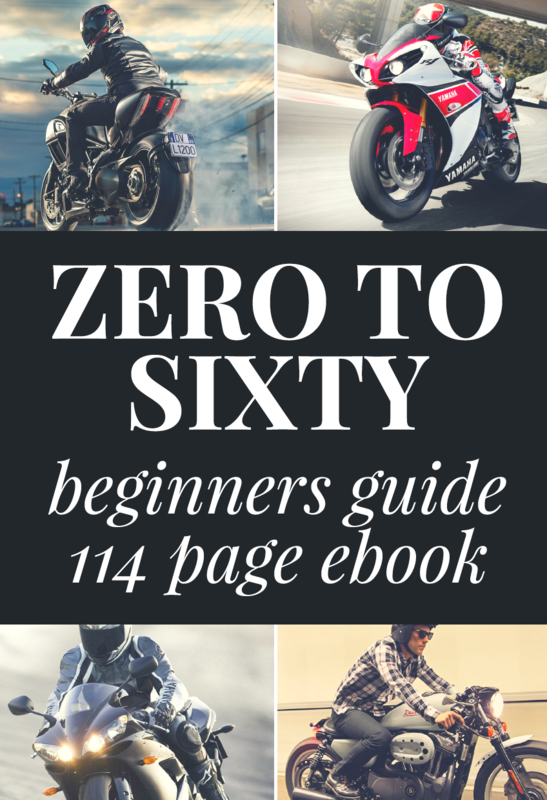 Sadly, I’ve never ridden a CB750A to this point, so I have to take their word for it. It did have a torque converter in it like a typical car transmission does and it used a fluid coupling to connect power from the engine to the transmission as such. 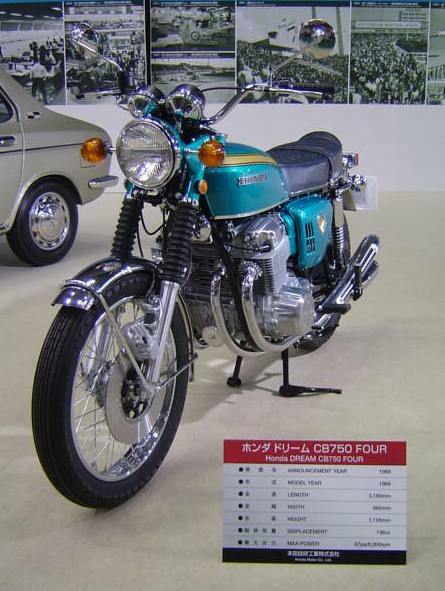 The engine and transmission shared the same oil supply and extra capacity was needed compared to the non-automatic version of the CB750. That oil would get really hot due to being used in the transmission and so oil changes done on time were critical to maintaining a healthy bike. Lowering the kickstand would shift the transmission out of either gear back into NEUTRAL. A good or bad safety feature depending on how you look at it I guess. One thing is clear about the Hondamatic and that’s the fact Honda was totally sold on it being successful and threw their full weight into making the technology work. 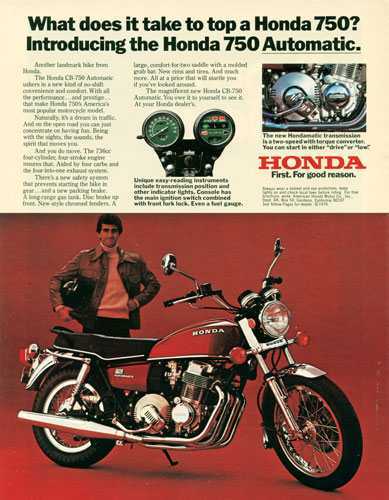 I believe Honda had beginner riders in mind when it released this motorcycle, but the reality was the bike was just too big and powerful to attract inexperienced riders, while veteran ones scoffed at the idea of a clutchless transmission. 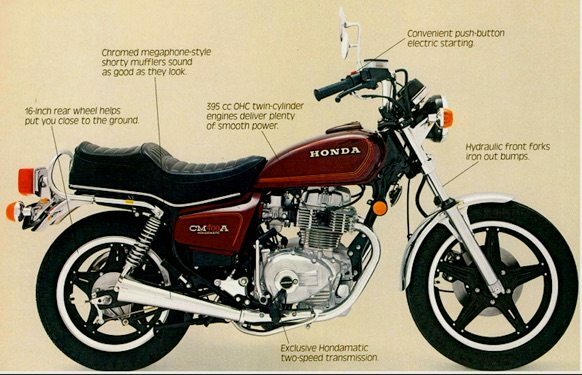 Honda wouldn’t give up on the automatic transmission idea and scrapped the CB750A in favor of the smaller, lighter CM400A instead which actually is just about the ideal learning bike thanks to its smaller 399cc engine. 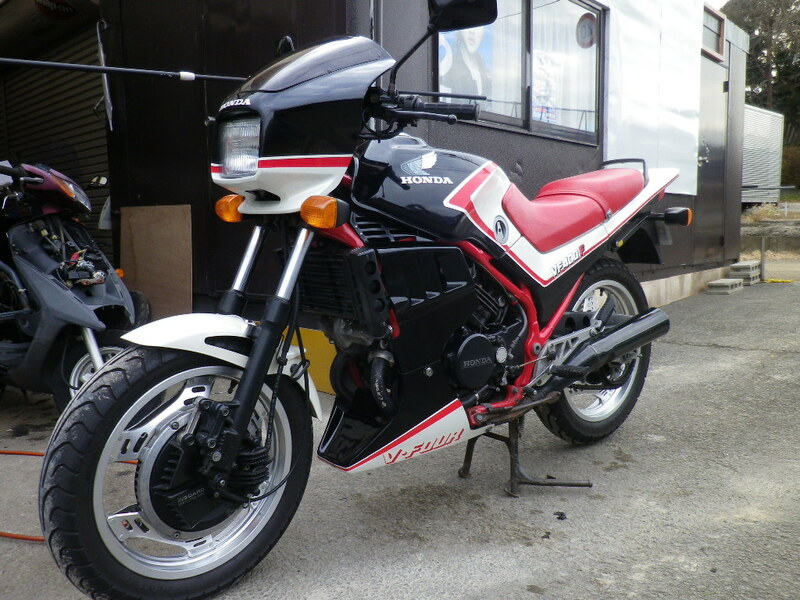 Honda still puts updated versions of the Hondamatic in quads these days with great success, but on the bikes it never took hold. The introduction more recently of the “automatic” Dual Clutch Transmissions from Honda have done better than the Hondamatic did, but still just aren’t as popular as Honda would like. 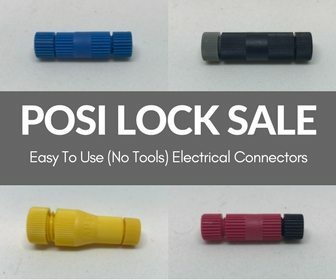 Great technology, but maybe the market just isn’t all that interested? Here’s an interesting bike that was way ahead of its time. 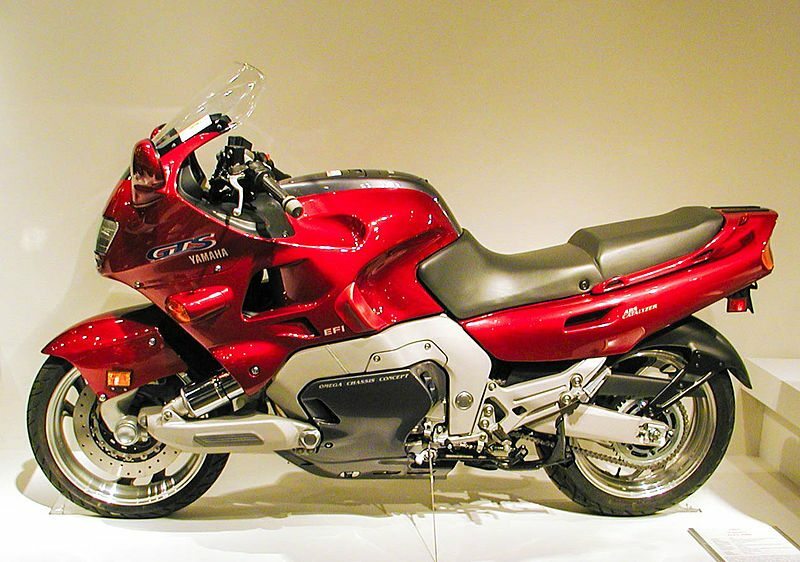 Introduced in 1993, the Yamaha GTS 1000 sport touring bike was only in production on year in the US before disappearing from the Yamaha lineup due to very weak sales. That makes it one of the rarest bikes anywhere. It was sold elsewhere in the world only until 1999 as well. The GTS 1000 had an innovative forkless front suspension that worked effectively (as Yamaha intended) in reducing front end diving when the bike was experiencing hard braking. Not just forkless, but the GTS boasted single sided front suspension as you can see in the next photo below. This strange configuration went by the name Parker RADD because it was designed by James Parker. RADD stands for Rationally Advanced Design Development according to James. This single-sided swingarm style had previously been used on some scooters and motorcycles, but not since the 40s and 50s making it all but forgotten until Yamaha put it on the GTS 1000. Other features that made this bike unusual in 1993 were ABS and a catalytic converter. The GTS used the same engine as the uber-powerful FZR1000 giving it 100 horsepower and 78 ft-lbs of torque in its 553 lb dry frame. Obviously, the GTS was technologically well-endowed and blessed with power, so you may be wondering why it was such an abysmal failure and yanked after only a year? Price. The GTS came in at $10,000 which was a ton of green for a motorcycle in 1993. The fancy options and RADD front end were expensive to produce at the time and buyers weren’t interested in the look either apparently. That message was sent loud and clear with their wallets staying locked shut, unfortunately for Yamaha. 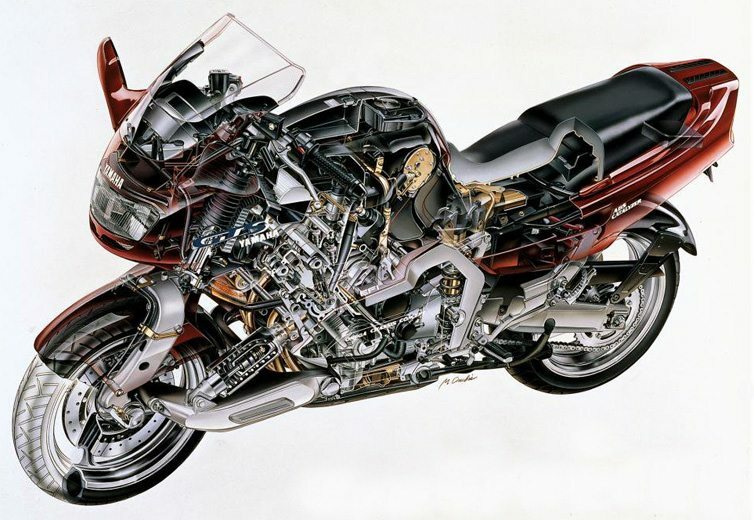 The GTS did open the door for the FJR 1300 to become one of the most popular sport touring machines in subsequent years, as Yamaha learned the hard way to stick with a proven formula by adding a couple of enhancements instead of starting from scratch. Was it fear of change that made all three of these turkeys unpopular or was it that they were legitimately weak products? I tend to think they’re all different and should be labeled differently. Honda’s inboard braking system just plain didn’t work in dissipating heat so yes I would say it was a poor product. The Hondamatic was and still is an excellent design that works very well, but just wasn’t embraced by the consumer with open arms. That one I would chalk up as people getting in the way of progress, especially in view of the fact automatic and electric bikes gaining popularity now. The GTS 1000 I personally find kind of ugly. The RADD front end does nothing for me aesthetically and anti-dive technology on telescopic forks these days has matched up to whatever advantage the RADD design produced too. Yamaha didn’t go far enough with the bike technology package to warrant the hefty price tag in my opinion. ABS is nice, but not too many people get excited about emissions or catalytic converters. 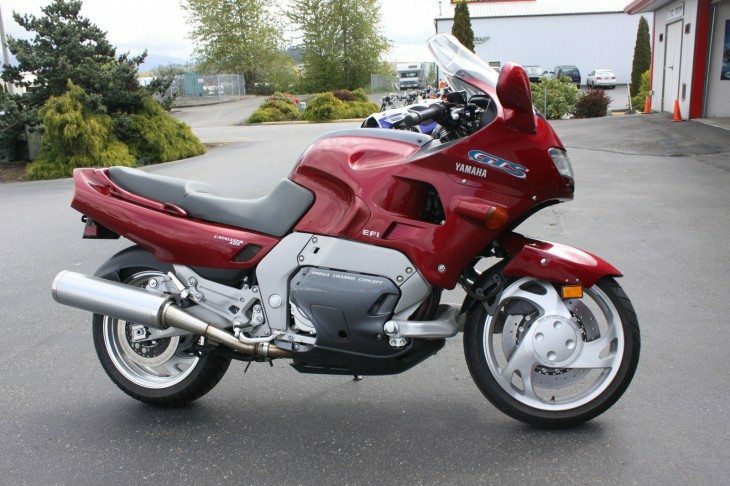 If they could have dropped in some of the modern wizardries we have now like Bosch Motorcycle Stability Control or even different ride modes, perhaps the GTS would have been the futuristic wonder-bike I suspect Yamaha wanted it to be.